What a great way to start a conversation, to just say hello, with a smile. And yet, that simple conversation starter is often impossible for 80-95 percent of people. 1. We should not annoy, or interrupt people. 2. When entering a room, we should acknowledge people, and say hello. Maybe the third belief system is, "I don't want to deal with this situation." I am Andy Lee Graham, and I believe it is the personal obligation of every human to say hello, smile, greet people as we live our lives. Especially, when we are alone in a room with another person, when we walk into a coffee shop, and there is only one person inside, for proper etiquette, we should say hello, and smile. If you are number 1, we should not annoy, or interrupt people, this choice guarantees you have almost no friends, never meet new people, your life is set in its ways, your whole life will revolve around the people you work with, the people you are forced into conversations at work. If you are number 2, your are ready to live the good life. If you are the third option, you don't care, you don't want friendship, maybe you are shy, maybe you need lessons, maybe you are the right person to read this page. There are categories of good conversation openers. 1. Notice, to notices something about a person, clothing, the location, all are good conversation openers. i.e. You have a nice scarf. 2. Ask questions; as simple as saying, where is the restroom? Where is the waitress? 3. 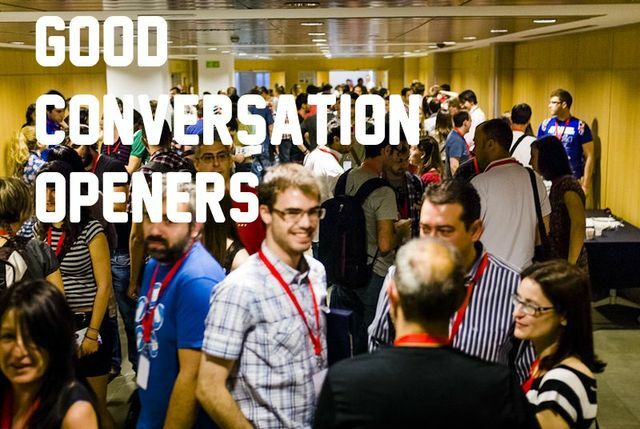 Interrupt a conversation; yes, this works, many people jump into conversations, and insert words of wisdom, or annoy, there is an art to good conversation starters. 4. Ignore a person by design; there are many super popular people who need annoyed, this burns them, why is this person ignoring me? Strangely as it sounds, especially when a man is trying to meet a woman, best to ignore the person. What are good conversation starters? Truly, a good conversation starter is not the problem; we must first believe that having a conversation with anyone is of great value. I remember when I was at Indiana University, we would go talk with the best friend of a girl we wished to know, made friends with the best friend, and this opened the door to talk with a girl of our dreams. Say hello, and smile to most everyone, your life will be great. Say goodbye, great manners will open any door.